Doxycycline hyclate is a synthetic antibiotic of the Tetracycline group of drugs, which inhibits the protein-building mechanism in the bacterial cells, thereby preventing their growth. The medicine has a wide range, as it is effective against several kinds of bacterial infections. This medicine is used to treat pneumonia, cholera, plague, urinary tract infections, various tick-borne rickettsial infections [including Lyme disease, Rocky Mountain spotted fever, babesiosis, yaws, relapsing fever and tularemia], and sexually transmitted diseases [STIs, such as syphilis and uncomplicated gonorrhea]. It is used to control severe acne, as a preventive for malaria, as well as to prevent and treat anthrax infection. It is used in adults and children who are 12 years or older. The medicine is available in several forms - tablets, capsules, and oral suspension for children. The dose depends on the age, individual condition, and the severity of the infection being treated. It may have to be taken once or twice daily. The medicine can be taken with a glassful of water, with or without meals. Take the dose exactly as prescribed. Plenty of fluids with the medicine will help you to overcome esophageal irritation and prevent ulceration. Taking your dose at the same time everyday will help by keeping a certain amount of medicine active in the bloodstream at all times. 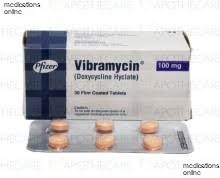 Vibramycin shouldn’t be administered in case a patient is allergic to its active component or other antibiotics of the tetracycline group, such as tigecycline, minocycline, demeclocycline, etc. To avoid risks and ensure the treatment course will bring only benefits, tell your doctor if you are suffering from any of the following issues: kidney or liver disease, increased pressure inside the skull, sulfite allergy, asthma, intake of such medicines as blood thinners, seizure drugs and isotretinoin. It is recommended to inform your healthcare provider if you are pregnant or planning to conceive before the start of the therapy. When the medication is taken during pregnancy, it may bring harm to a future child and affect bone and tooth development; when administered in the last trimester, Vibramycin may cause further tooth discoloration in a child’s life. Note that the use of this drug is able to reduce the effectiveness of birth control pills, so try to switch to non-hormonal birth control methods to prevent unplanned pregnancy. Consult your doctor if you miss a dose. If you do miss a dose, then try to take the missed dose as soon as you can, but if time is nearing for the next dose, then leave the missed dose and take the regular one; but don't double your dose. An allergic reaction such as:- itching, rash, swelling of the mouth/throat, wheezing, or difficulty in breathing means that you should stop the medicine and ask your doctor for help. Overdose symptoms can include: nausea and vomiting. US residents can call the US national poison hotline at 1-800-222-1222. In the unlikely event of the victim collapsing or not breathing, call local emergency services at 911. After you buy Vibramycin, store it at a room temperature below 30 C, away from heat, light and dampness, but do not freeze. Keep it out of reach of children and pets. As long-term therapy for treating an infection necessitates regular laboratory evaluation [especially if it is an infection of the genito-urinary tract], you must keep all your lab appointments. If you are taking this medicine as a preventive for malaria, the first dose should be taken 1 or 2 days before you travel to a place where there is a risk of contracting malaria. After that, the medicine should be taken daily through your travel till 4 weeks after leaving that place, but not exceeding 4 months. If you are unable to finish the therapy for some reason, consult your physician. While staying in a mosquito-infected place, use insect repellants and mosquito nets. For those being treated for acne, stay out of sunlight/strong lights, wear a hat and sunglasses, use a sunscreen, and apply cosmetics after consulting your dermatologist.